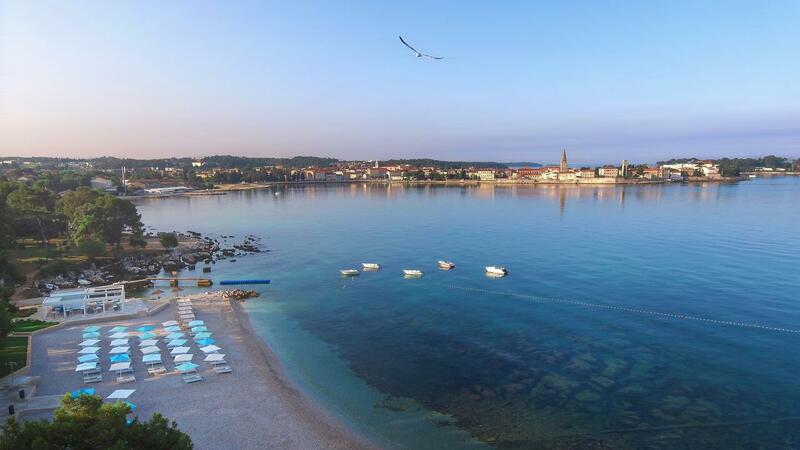 Beach Volleyball Inc is heading back to Poreč for its second trip to the beautiful coastal town, on the North West coast of Croatia. Fresh from hosting a Swatch FIVB World Tour event, this small, idyllic venue is the perfect place for us to kick off the volleyball summer whilst soaking up the rays and experiencing the local culture of the Istrian peninsula. We believe you won’t find a better location from your bed, to breakfast and onto the beach courts. Then into the pool and lunch its the easiest beach camp you can find. Siesta and repeat the beach! Family and Friends can stay too, just email for info. Croatia is increasingly becoming one of Europe’s most popular tourist destinations. This is largely due to it’s excellent (and reliable) climate! You can expect to enjoy up to 12 hours of sunlight a day in May, more than other holiday hotspots such as Provence or Corfu. Situated on the coast of the balmy Adriatic sea, you certainly won’t lack for opportunities to start an early summer tan before cooling off with a variety of water sports available locally. 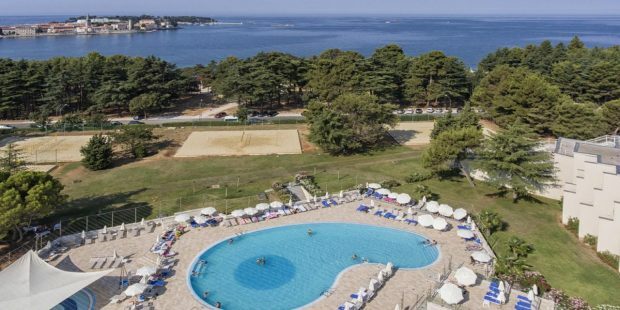 Alternatively, you can explore the picturesque old city centre of Poreč which is a short 20-minute walk along the seafront from the hotel. You’ll be spoiled for choice when it comes to finding nice places to eat and drink on the waterfront with amazing views. What’s more, you’ll be delighted by the size of the bill when it arrives due to Croatia NOT being part of the Euro … A nearby, cheap, sunny getaway to a location yet to be ruined by mass tourism?!? Rare in today’s world!!! 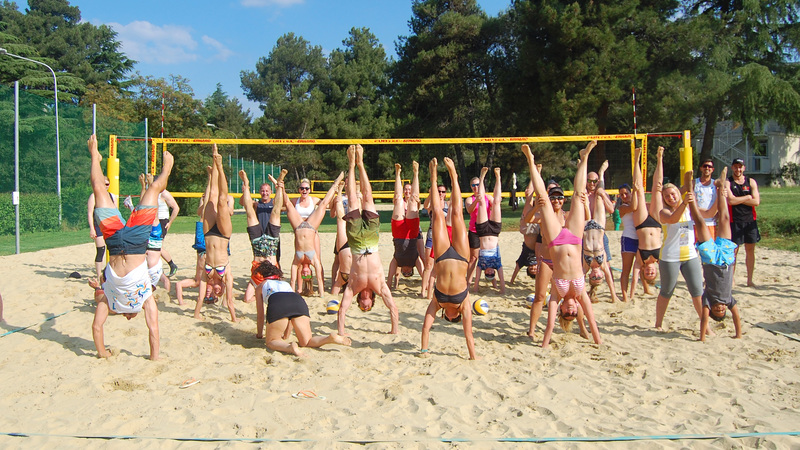 Like our other camps, we will provide a fun, social atmosphere in which we will aim to improve the already committed beach volleyball player over five intensive days of coaching and one tournament day. Each camp has a maximum of 32 people run over 4 courts with a minimum of 1 coach per court (per 8 players) plus normally one trainer. In addition, there will be 6 open play sessions every afternoon with competitions (Sun to Fri) from 4:30 to 7 pm with 3 tournaments to enter. We can’t be compared to other camps. That’s a whopping 40 hours of volleyball! Our aim is to make sure we are taking a keen interest in your personal development. As a team of coaches, we collectively debrief about every player daily and then create training suited to their individual needs; this is a coaching camp for you not only to learn new drills and work hard but to understand your own mechanics and go home with new knowledge to apply beyond the training. Arrival Saturday (Easy Jet) late evening arrival of guests. Please note all rooms are booked Saturday to Saturday unless requested. Please message before booking is confirmed as rooms have to be agreed and changed by the hotel. 15:30-19:00 Open gameplay – getting to know you, coaches jump in and play. 16:30-19:00 open gameplay every day. Coaches will be there to offer advice on any and all aspects of the game as well as jumping in and playing with you all. We love to play and learn on the court with you. 19:00 Our evenings are very gentle, eating, relaxing, socializing over dinner, nothing too taxing….we think you might just need to eat and sleep! Tuesday afternoon Coaches Cup Team Competition, 5 pairs v 5 pairs. Friday evening meal, last night dinner and awards. 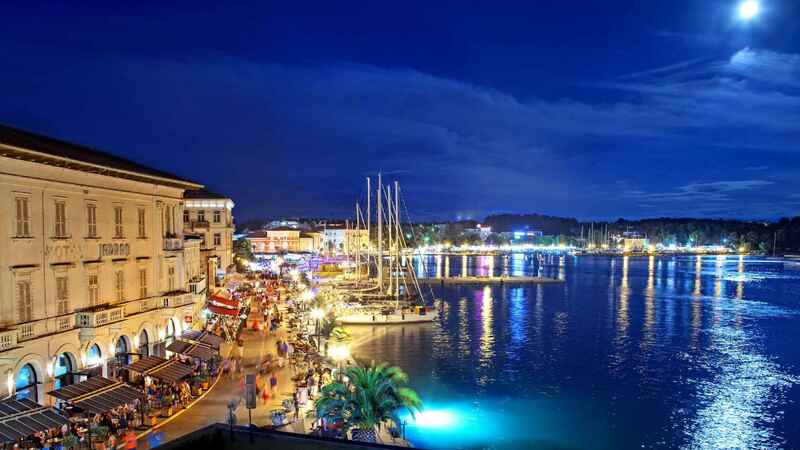 We will visit the town and enjoy an evening in Porec. 14:00-17:00 King and Queen of the Camp using the four in a pool format playing games with everyone in your pool to crown the King and Queen of your division. Finish in time for Saturday evening departure. Costs by BACS or IBAN. When booking please state who you would like to share a room within the extra information. We have limited single rooms available please request early. If you would like your non-playing partner to share a room please contact the office directly. All rooms are twin or double. If you have a person you would like to share with please state on booking form. Flights are your own responsibility as well as insurance. Pula is the closest airport or if you are looking for an adventure car hire from Trieste or drive up from any other Croatia City. Have an adventure. We recommend insure 4 sport who covers our coaches and we use for our company insurance. The link is for individual player insurance for volleyball for a year. UK residents don’t forget to click worldwide. Bookings can be accepted after this date, payments will be made in full and no flights should be booked until rooms are confirmed. To book your coaching offline or if you need more information please contact Denise Austin on 0777 33 82 305 or email denise@beachvolleyballinc.com.